Behold the gruesome past of London. Built on bone and blood by Roman conquerors nearly two millennia ago, the long and violent history of the capital makes it a hotbed of lingering spiritual menace and malevolent paranormal activity. It’s bloody, it’s brutish, it’s packed with the tortured souls of the dead, and it’s perfect for one of our award-winning haunted tours. London is bursting with sights and stories of the otherworldly, and for those with the courage to explore the darker side of history, it’s a sight to see. And from where better to bask in the depravity of the capital’s coloured past than aboard our own twisted version of a London tour bus, The Ghost Bus Tours? 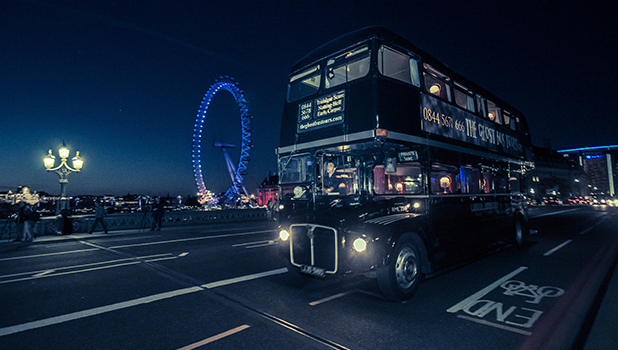 A 1960s Routemaster bus with an eerie backstory and a serious gothic edge, The Ghost Bus is the haunted chariot that’ll carry you on your journey throughout the darkest corners of history. This London sightseeing tour lasts approximately 1 hour and 15 minutes (depending on traffic), and you will be dropped off again at our stop on Northumberland Avenue. Closed 24, 25, 31 December and 1 January.